Financial Aid is available to help defray tuition costs. We are committed to keeping Catholic education available, accessible and affordable for all. Affordable starts with keeping tuition costs as low as possible. Financial aid packages are available to Holy Trinity Catholic School families who qualify. Funding comes from the Second Century Fund and the Opportunity Scholarship Tax Credit Program. The Second Century Fund, made available through the Altoona-Johnstown Diocese, provides financial assistance through the EITC Scholarship Fund. To qualify, the maximum income level for families is $76,350. Each eligible school-aged child increases this income by $15,270. For a family with one child the income is $91,620, for two children $106,890, etc. The Opportunity Scholarship Tax Credit Program is a program offered exclusively to families residing in low-performing school districts. Holy Trinity Catholic School is using an independent service called FACTS to evaluate all applications for financial aid. Decisions are fair and confidential. To apply for financial aid from either the EITC Scholarship Fund or the Opportunity Tax Credit Program, families must submit a completed FACTS application. 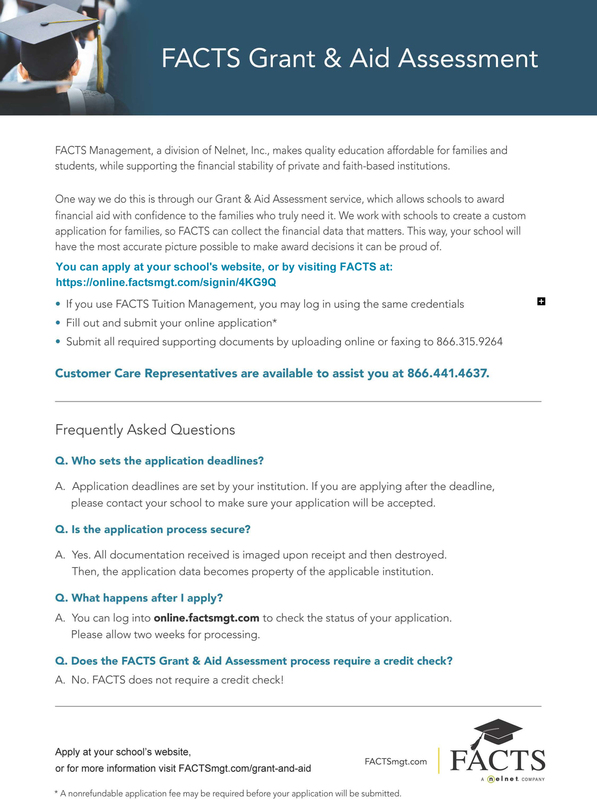 Below is a document from the FACTS organization that gives additional detail about the financial aid application process.